When I started Win32 exploit development many years ago, my preferred debugger at the time was WinDbg (and some Olly). While Windbg is a great and fast debugger, I quickly figured out that some additional/external tools were required to improve my exploit development experience. 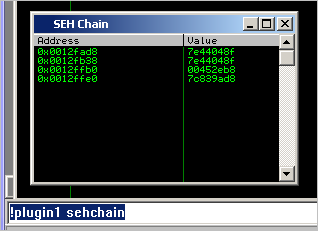 Despite the fact that the command line oriented approach in windbg has many advantages, it appeared not the best tool to search for good jump addresses, or to list non-safeseh compiled / non-aslr aware modules, etc…. Ok, looking for a simple “jmp esp” is trivial, but what if you are looking for all pop pop ret combinations in non-safeseh compiled modules… Not an easy task. It is perfectly possible to build plugins for Windbg, but the ones that I have found (MSEC, byakugan (Metasploit)) don’t always work the way I want them to work, and would still not solve some issues I was having while writing exploits. OllyDbg and Immunity Debugger are quite different than windbg. 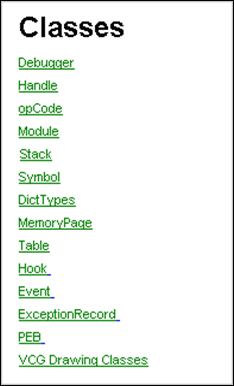 Not only the GUI is very much different, the number of plugins for these debuggers is substantially higher. After evaluating both of them (they pretty much have the same look and feel), and evaluating the way plugins can be added, I made the decision to focus on Immunity Debugger. That does not mean OllyDbg is a bad debugger or is limited in what you can do in terms of writing plugins… I just found it harder to “quickly tweak a plugin” while building an exploit. OllyDbg plugins are compiled into dll’s, so changing a plugin would require me to recompile and test. Immunity Debugger uses python scripts. I can go into the script, make a little change, and see the results right away. Simple. Both OllyDbg and Immunity Debugger have a good amount of plugins (either contributed by the community or made available when you installed the product). While there is nothing wrong with these plugins (or PyCommands in case of Immunity Dbg), I really wanted to have a single plugin that would help me building all (stack based) exploits, from A to Z. This idea got translated into my pvefindaddr PyCommand. My obvious choice was Immunity & Python. I’m not a great python developer (at all), but I have been able to build my own PyCommand in a relatively short amount of time. This proves that it’s really easy to build custom PyCommands for Immunity, even if you are not an expert developer. If I can do it, then you can for sure. The only issue I faced (apart from learning python syntax and getting used to python’s hmmmm “slightly annoying” indentation requirement) was finding out how the Immunity-specific API’s/methods/attributes work. To be honest, the API help included with Immunity Debugger was not a great help. It basically only lists the available methods/attributes/… and that’s it. No explanation on what these methods & attributes behave, on what they’re supposed to do, or how to use them for that matter. Ok, once you start understanding how things work, they are still a good reference, but when you are learning from scratch, a little persistence may be required. Luckily, since Immunity comes with a lot of PyCommands, those can be used as a reference. Anyways, it’s still a good idea to use the ImmDbg Python API help file too. You can get access to the API help in Immunity by navigating to “Help”, select “Select API help file”, and selecting the IMMLIB.HLP file from the Documentation folder. My main goal today is putting together a reference/cheatsheet for anyone interested in writing pycommands, so you can start building your own plugins faster than I did ” /> ). This is not going to be “the complete reference”, but it should help you start to build your own plugins. This filename is important, because you will need to launch the PyCommand based on the filename. 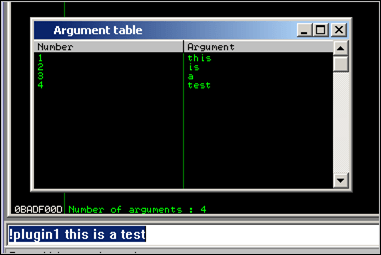 The arguments/parameters specified when launching the PyCommand are captured in the “args” array. You may have noticed that the script above does not seem to output anything. While the syntax is perfectly correct, there is no visible default output window, so you will have to tell the plugin where to write the output to. There are a couple of options : you can write to the Immunity Log window (which is the most commonly used technique), a new/separate table (which is nothing more than a new window that can list the information in a table), or to a file (which may be a good idea if the amount of output you are generating would overflow the Log window buffer. 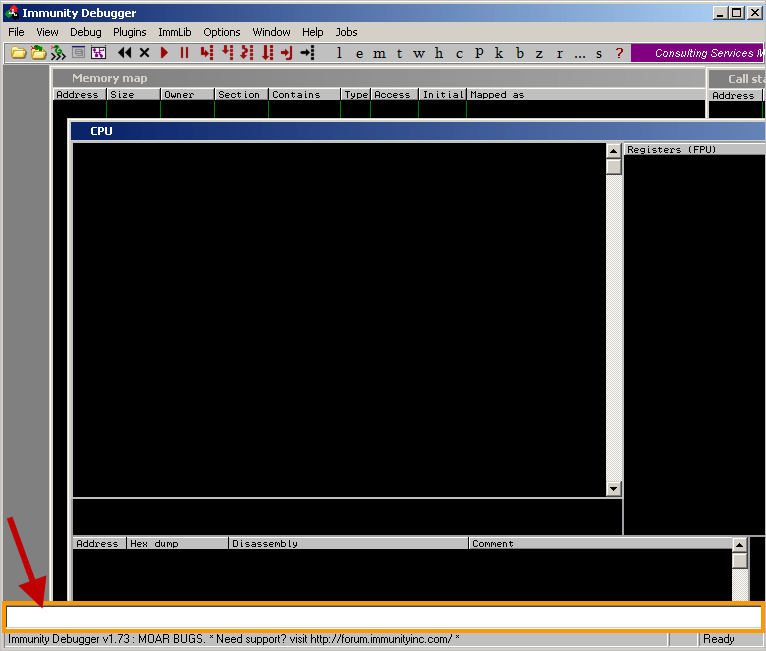 The Log Window is a part of the debugger. 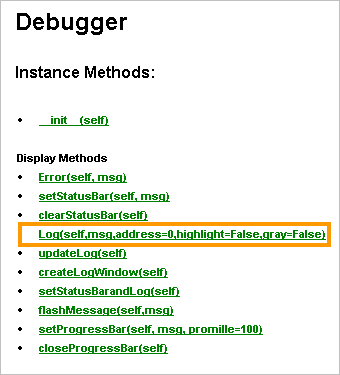 So we will need to use the debugger instance that we have declared earlier (imm) to write to the Log. You will notice, as you continue to build your plugin, that when you search through memory (or perform any other CPU intensive task), the log window may not get updated right away. Immunity may appear to be hanging for a while, and when everything completes, everything is shown in the log window (or table for that matter). The only (big) disadvantage is that it will also slow down the CPU intensive task that you were performing. So it’s a trade off between seeing what happens in real time, and speed. It’s up to you to decide. Writing output to the Log or a table works fine, as long as the amount of data doesn’t overflow the available amount of Log buffer space. If that is the case, you could consider writing output to file as well as to Log or a table. This is not Immunity specific in any way – it’s just python code. def resetfile(file1): FILE=open(file1,"w") FILE.write("") FILE.close() return ""
def tofile(info,filename): info=info.replace('\n',' - ') FILE=open(filename,"a") FILE.write(info+"\n") FILE.close() return ""
Remember : anytime the Immunity API says a method uses “address”, you need to specify an integer value. In certain cases, you’ll probably also want to convert opcodes to instructions, and vice versa. There are 2 ways to perform a search. You can provide the asm code, use Immunity to convert it to opcodes, and perform the search; or you can provide the opcode and perform the search. That wasn’t too bad, was it ? Note : when you search through memory, it will search all process memory (loaded modules and outside loaded modules, but always limited to the memory that is used in the process). As stated earlier, searching through memory can make your CPU spike to 100%. The readMemory() method requires 2 arguments : the location where you want to read, and the amount of bytes to read. – does it belong to a module and if so, which one ? – what is the baseaddress and size of the module ? – is this module compiled with safeseh or not ? – is this module alsr aware or not ? – what is the access level at a given memory location ? We’ll pretend you have performed a search, and “result” is an element in the search results array. Is this module compiled with safeseh ? Is this module aslr aware or not ? Immunity plans to fix some method/attribute inconsistencies (especially with uppercase/lowercase characters in the function/method names) in a newer version of Immunity (and the Immunity libraries). As a result of that, you may have to fix your PyCommand in order to make it work with newer versions of the debugger. This reference is far from complete and there is a lot more you can do with the Immunity API. I only wanted to give you a head start if you want to build your own PyCommands. If you have built your own new PyCommand, share it with others – I’m sure other people can benefit from your work too.